When a human family member or friend has passed, it's customary to have a burial site with a grave marker to remember that person. You can also do the same for your pet, providing a physical marker for the resting place of your beloved companion. 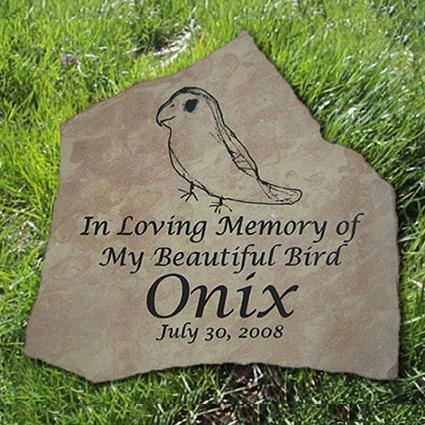 Pet grave markers come in a variety of different stones and colors, in both traditional and custom materials. Price varies widely based on the size and type of stone that you want. At Peternity for example, you can expect to pay around $75 for a flat, flagstone marker, whereas a larger, thicker headstone runs closer to $200. For a yard or a garden, a metal marker makes a great option. Metal markers tend to be less traditional in shape which may make them less suitable for a pet cemetery. Metal markers also tend to be less expensive than stone. For example, Pet Haven Express has aluminum pet markers for around $64. 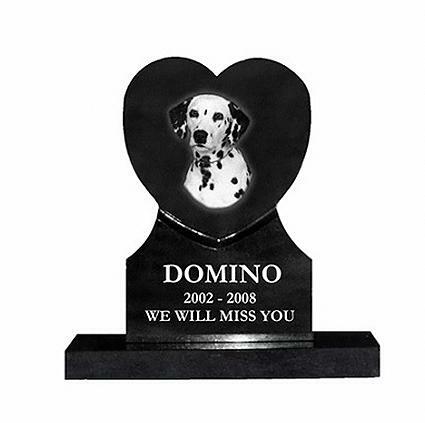 If you need a custom design, Monuments offers stone markers inlaid with bronze made to memorialize your pet. Custom markers are much more expensive with the price depending on size and materials, but you can expect to pay between $200 to $400. Regardless of the material you choose for your pet's grave marker, be assured that materials are thoughtfully selected to be able to withstand the outdoor elements for years. There are two basic styles of grave markers similar to what you're familiar with in any graveyard. Flat grave markers lie flat on the ground. They tend to be less expensive because they require less material to make. Despite their smaller size, flat-lying graves markers can still contain the same information and graphics as the more elaborate upright gravestones. Affordable Markers has granite flat markers ranging from $188 to about $210. Some graveyards require flat markers since they help maintain a park-like appearance in the graveyard. Most companies can contact the graveyard for you to inquire about any requirements. Upright gravestones are stones that stand upright on a stone base. In general, upright grave markers tend to be more expensive because they are larger, and therefore, require more material to make. 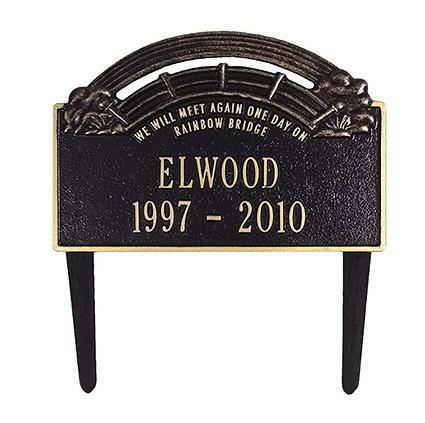 Memorials.com has upright grave markers ranging from $300 to over $600. It is possible, however, to find smaller upright headstones for less. Etsy has a much smaller upright granite grave marker for around $90. Pet grave markers not only come in a variety of materials, but they also come in a variety of shapes. Memorial Gallery Pets has traditional shaped headstones that are priced around $70 to $270. This more traditional style of grave marker may be exactly what you are looking for. If you're looking for something a little more unique for your pet, you may want to look at some of the distinctly shaped pet markers. Paw prints and bone shapes are very popular and can be affordable. Perfect Memorials has both bone and paw print shapes, starting around $35 for non-customized and up to $375 for customized stones. Standard cat and dog shapes are a little more difficult to find, outside of the metal markers discussed above. However, Bronze King is willing to do a custom sculpture done of your pet, although you'll need to contact them for pricing information. If you're looking for a cat or dog shape but not a custom sculpture, concrete statues of a cat or a dog can also be used as a grave marker for your beloved friend. Wayfair has many dog and cat sculpture options with prices ranging from around $23 to $215. Not every lost pet is a dog or a cat and there are grave markers available for a variety of other animals. King Custom has grave markers of all different sizes which can be personalized with text and pictures of animals such as bunnies, hamsters, horses, ferrets, guinea pigs, lizards, and parrots. Four-by-six-inch rocks cost $30 while 12-by-18-inch boulders cost $150. Most companies that make pet markers will work with you to memorialize any pet that you choose, but finding markers with shapes associated with animals other than dogs and cats can be very difficult. 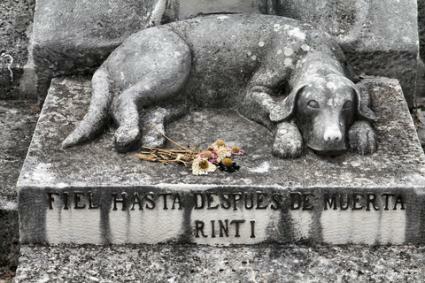 What you decide to put on your pet's grave marker is limited only by your imagination. You can have any text engraved, such as your pet's name, their date of birth, and their date of death. You can add any sentiment you'd like, or you can choose a popular sentiment like "The Rainbow Bridge," or "Have You a Cat in Heaven, Lord?" With most companies, the text and engraving are included in the price of the marker. Some companies will clearly state if a limited number of lines of engraving is included with the price of additional text. Regardless of what you choose to do, the goal is to design a marker that is unique to your pet. If you are unsure of what you'd like to put on your pet's marker, look online and remember that every company has people that are willing to assist you. You may have lost a member of your family, but you will never forget your pet. By investing in a grave marker, you will have a visual of the love that you and your pet shared reinforced every day. You will be reminded that someday, you will see your pet again and the two of you will cross the rainbow bridge together.